Next up is a Polaroid instant camera and what…a carphone? Dominating the middle area there is an early Mac laptop, a digital watch, and a pager. Moving counterclockwise we’ve got a JVC camcorder, and that beautiful piece of clunk on the far left is an early Apple PDA, deliciously named the Apple Newton. Together these items played music on the go (limited to one tape), took pictures on the go (limited to one roll of film), made phone calls (limited by biceps strength), did computer-y stuff (very, very slowly), told you the time and woke you in the morning, alerted you to find a phone to call someone (said phone was usually plugged into a wall and sometimes accepted quarters), took video (and played it back), and recorded notes and names and addresses. The smartphone on the bottom there doesn’t just do all that—it does it all as good or better at a fraction of the size and cost. 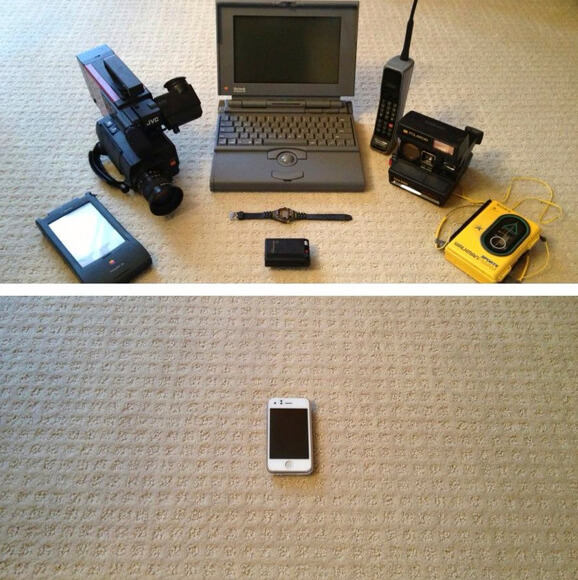 And these are just a few of the physical items “absorbed” into smartphones. Other examples include flashlights, maps, mail, books, handheld video games, calendars, guitar tuners…the list goes on. Moral of the story? Moore’s Law is no joke, and it’s coming soon to an industry near you.